The DECO` line of transparent stained glass paint is composed of 13 transparent and 3 opaque colours, all of which can be mixed with each other. The drying time is minimum 48 hours and depends on the thickness of the applied coat. The DECO` line of transparent stained glass paint is composed of 13 transparent and 3 opaque colours, all of which can be mixed with each other. The decorated glass must be cleaned well and degreased with a little rubbing alcohol or acetone. It is recommended to work with a horizontal surface to keep the paint from trickling. The drying time is minimum 48 hours and depends on the thickness of the applied coat. The paint crystallises a little faster in an oven at the temperature of approximately 60°C. 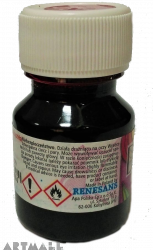 To improve resistance to weather conditions, it is recommended to apply a layer finishing varnish no. 200 on VERY WELL dried paint (even after 1 month). However, you cannot apply another coat of paint on dry DECO` paints because it will raise the previously dried cover. The resistance to light of the applied dyes is very high but depends considerably on the paint concentration, which means that the paint in its initial form is much more durable than when thinned with emulsion or thinner and that a thicker layer is more durable than a very thin layer. The slow drying process is caused by the alcohol content and has a positive effect on even paint distribution into the outline and elimination of streaks. Clean the decorated surface with a damp cloth. Do not use liquids and detergents, which may contain thinners. 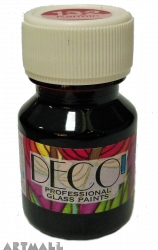 Deco paints from Renesans create a great transparent effect on glass surfaces. Paints are suitable for professional use. The DECO` line of transparent stained glass paint is composed of 13 transparent and 3 opaque colours, all of which can be mixed with each other. The decorated glass must be cleaned well and degreased with a little rubbing alcohol or acetone. It is recommended to work with a horizontal surface to keep the paint from trickling. 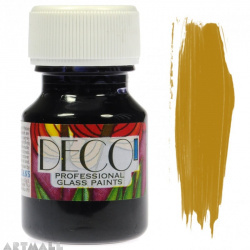 The DECO` paints take much longer to dry than other paints for glass available on the market.